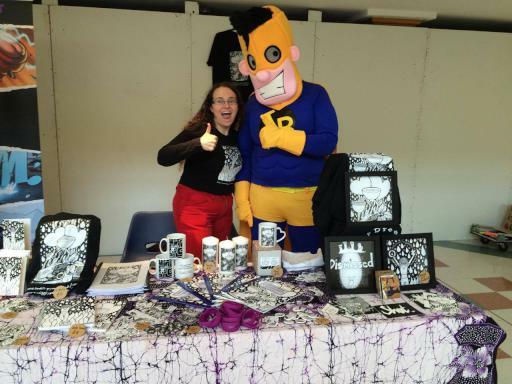 Back in the summer I took part in the True Believers Comic Festival mini-mall con. I took just Love: A Stranger Dream merchandise which was still quiet a lot of stuff from post cards, to key rings, to two types of mugs, to candles and t-shirts as well as framed prints, poetry cards and the actual book! I should merchandise, I broke even, my family dressed up and ate cake, I did not sell any of the actual books thought some online sales mysteriously happened over the next few days! I did get asked alot about weather I would do illustration work for people which is always nice and had lots of great conversations…. I also got denounced as the Devil by an american lady who was freaked out by the whole event. So as far as having edgy art work goes I think that is probably the best accolade! Categories: A Stranger Dream, Festivals and Events, Merchandise.